The famous drive-ins and diners that popped up along Route 66 were showcased in Illinois. The campers were transported to a 1950’s style diner area, complete with “Rosie the Car hop”. Campers made their own homemade ice cream in a bag and, if they chose to, could combine it with draft root beer for a cool, refreshing root beer float! The diner experience was also a great photo-op with the addition of a pink Cadillac car cut-out. Traditional favorite songs of the era played in the background. 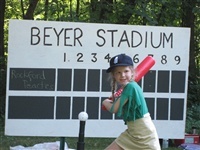 Also in Illinois, the All American Girls Professional Baseball League was introduced. In the 1940’s, the Wrigley family recruited women players to “fill-in” and play ball at Wrigley Field while the men were away fighting in World War 2. Little did they know that the women’s league would last for many, many years and become a classic theme in the motion picture, “A League of Their Own”. Girls were able to participate in a baseball relay race by hitting from a tee, running the bases and completing several charm school tasks while doing so! Balancing a book on their head, signing an autograph book and waving to a cheering crowd were all part of the fun. Each camper received a ticket to the game and an authentic reproduction of an AAGPBL trading card for their camp scrapbook. Missouri is known as the Cave State. 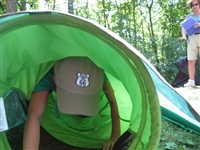 Campers were encouraged to learn about caving, the formations inside a cave and the creatures that live in caves. Crawling thru a tunnel and into caves (tents) to explore, as well as creating cave art with pastel chalks and sandpaper helped girls of all ages learn about caves. 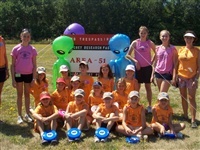 At this site, girls played a fun version of baseball and were encouraged to pursue it in a recreational setting. They learned the history of women changing barriers in the sporting world. Campers prepared a simple dessert and received a copy of the recipe to make for family and friends. Everyone was encouraged to overcome fears of small places (the tunnel) and dark places (the “caves”) as well as have the opportunity to explore things that grow in and live in caves in a safe and supportive environment. Kansas and Oklahoma lie right in the path of Tornado Alley. With help from a female intern from the National Weather Service Station in Chanhassen, campers learned about tornadoes, what makes them form and what precautions to take in case of a real weather emergency. After a question and answer session with the intern, campers had the opportunity to do a scientific experiment and actually make their own tornado vortex in a jar! Oklahoma is home to the Cowboy Hall of Fame. 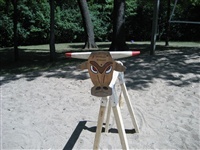 We were able to secure lassos from the Minnesota Rodeo Association and try sawhorse roping! Campers participated in a Cowboy Olympics which included barrel racing on broomstick ponies and a bedroll relay race. Knot tying and bandana tricks rounded out this adventure and everyone received a scrapbook souvenir blue ribbon for their part in the Cowboy Olympics. 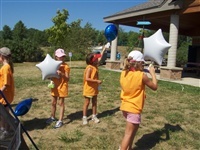 Brownies who attended camp completed all requirements toward the “Ready, Set, Go Camping” Try-it while at this activity. In remembrance of the Dust Bowl of the 1930’s, a Kansas Dirt Storm snack was offered. Campers were instructed on assembly of this parfait of pudding, crushed cookies and whipping cream…yum! 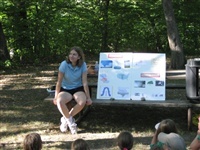 At this site, campers had the opportunity to meet and speak with a young woman intern from the National Weather Service. This intern had great influence with the girls at camp and was inspiring to all! Campers learned a portion of the history of women in aviation, interesting facts about meteorology and could experience firsthand the use of a lasso. 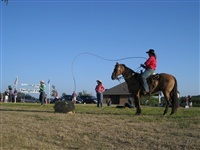 The Minnesota Rodeo Association also provided a live demonstration one evening of camp and showed everyone slow motion barrel racing and roping techniques. 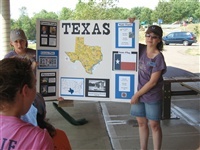 Texas and New Mexico offered a variety of activities. A traditional snack of blue corn chips, salsa and fresh corn muffins was offered. Campers made their own butter in a jar and had the opportunity to try prickly pear cactus juice! 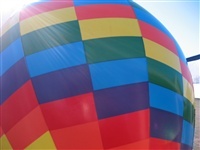 The Albuquerque New Mexico Hot Air Balloon Fiesta was celebrated with the construction of individual gondolas. Each girl was able to make and design her own gondola, insert a helium filled balloon and have a balloon race with other campers! An actual small scale balloon was inflated by adults to show campers the science of hot air rising to inflate the balloon. 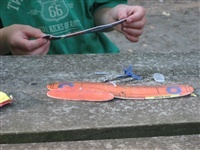 Each camper received a vintage jacket patch from the real Albuquerque festival as a memento for their scrapbooks. At this site, all girls were encouraged to think about the mechanics of hot air rising and what it takes to maneuver a hot air balloon. They were encouraged to try their luck with playing Frisbees golf and had to concentrate on using their eye-hand coordination. 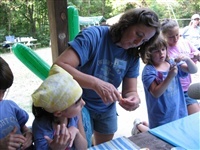 By making butter, campers again saw the result of a scientific experiment and were able to see that a little work goes a long way in making a tasty treat! Arizona and California mark the end of historic Route 66. Arizona’s Grand Canyon provided the backdrop for a hike. Campers assembled a simple trail mix and learned nutritional information regarding the ingredients in a good snack to take hiking. A veteran camper and hiker was present to show the differences between gear one would take on a day trip, a short hike, a daily walk or a longer hiking trip. Appropriate gear was available for inspection. “Leave No Trace” hiking was discussed and encouraged. The formation of the Grand Canyon was introduced via a handout from the park services and each individual was given a copy of it for their scrapbook. A sand art key chain craft was assembled by each camper as a token to remember the beautiful painted deserts of Arizona. The famous Le Brea Tar Pits in California provided a great opportunity for digging up the past. 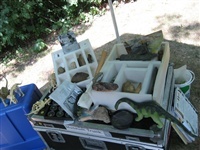 With the use of the Science Museum of Minnesota’s dinosaur trunk, campers at this site were able to see actual dinosaur relics, compare them to photos and discover some facts about the animals and vegetation found in the tar pits. Giant sand “rocks” containing fossils and such were available for the archeologists at camp to tap into for exploration. 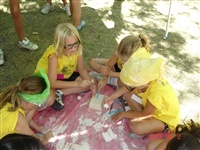 Each camper had the opportunity to cast their own fossil in plaster. The formation of fossils was also demonstrated with a clay and sugar cube experiment which showed everyone how the more protection an item had, the better fossilized it became. California’s famed Santa Monica Pier was the final stop on our road trip down Route 66. Team volleyball was offered in a real sand volleyball pit. After a brief warm up, adult volleyball specialists were on hand to show basic moves to girls unfamiliar with volleyball and offer pointers and tips to those with more exposure to the game. 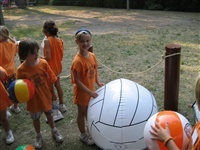 Everyone was encouraged to participate in a team game for fun and campers were also urged to participate in sponsored volleyball programs. At this site, the beauty of an American landmark was really brought to light. Several forms of fitness were offered and everyone was encouraged to add walking or hiking as well as volleyball to their fitness routine. Healthy snacks were discussed. The environment of ages gone by was introduced with the fossil dig and Leave No Trace was strongly encouraged to help keep the environment today as healthy and clean as possible.